Saturday was one of the most purely enjoyable days of the festival. All I did was watch movies and I think the simplicity of it all appealed to me. My energy started to flag a little, partly because I hadn't had a sit down meal for too long, and because I attempted another midnight movie, but I was still having a blast. The first film of the day was Colleen Moore's last silent film, Why Be Good? (1929). Long thought to be lost, it was finally found and restored, and in 2014 Warner Archive released it on MOD disc (my review here). I found it to be the quintessential flapper film, with lots of fun parties and frocks, the frivolity leavened by a still relevant discussion of the double standards women, especially young women, face in romance. 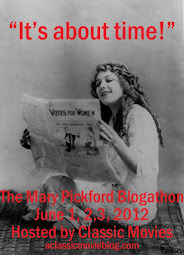 And it isn't all about people who write blogs either. 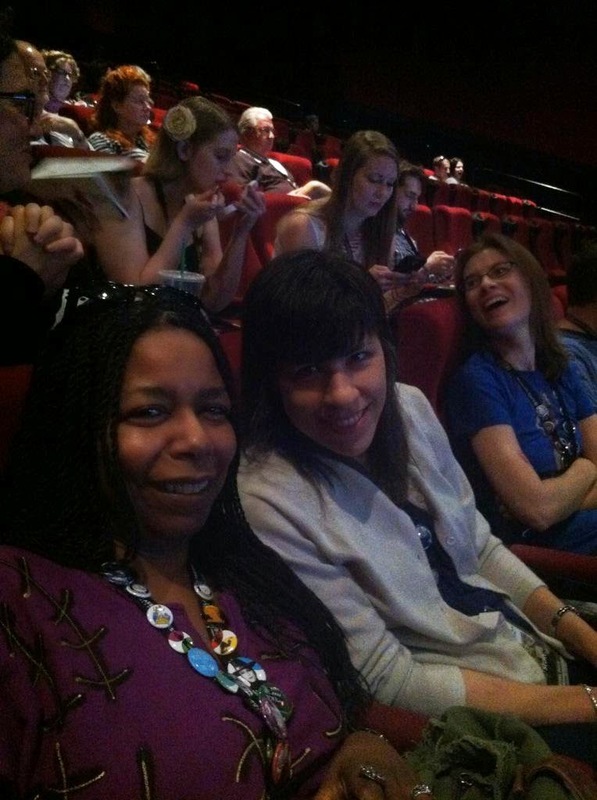 While I naturally gravitate towards people who write about the movies, I also enjoyed the company of many people who were there simply to check out the films. I found watching Why Be Good? to be especially enjoyable with a audience. It's got a very crowd friendly mix of comedy, lively flirtations, glamour and wit. 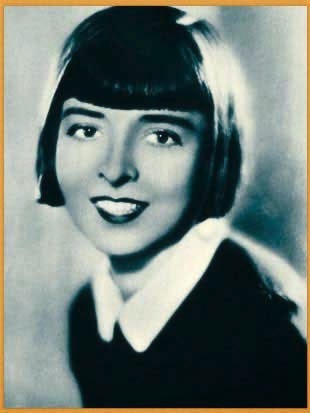 I hope that more Colleen Moore films will become available in the future, because she is an appealing actress: a mix of girl-next-door friendly and movie star charismatic. After the film, I got right back in line again for 42nd Street (1933) in the same theater. Broadway star Christine Ebersole helped with the introduction, and while she didn't seem to know much about the movie, she had plenty to say about the actual 42nd Street. While I enjoyed the slightly tart and very amusing Ebersole, I was disappointed that the intro. didn't include more tidbits about the film. I would have gone to see a Busby Berkeley-choreographed musical on the big screen whatever the condition of the print, but it was especially exciting to see it in a new restoration. This version of the film will be used for the upcoming Warner Archive Blu-ray release. I sat very close to the screen for this one, ready to soak up every gorgeous detail. Though I've seen 42nd Street more times than I can count, I still laughed at all the jokes, and every number thrilled me. Something about that movie is eternally fresh and alive to me. 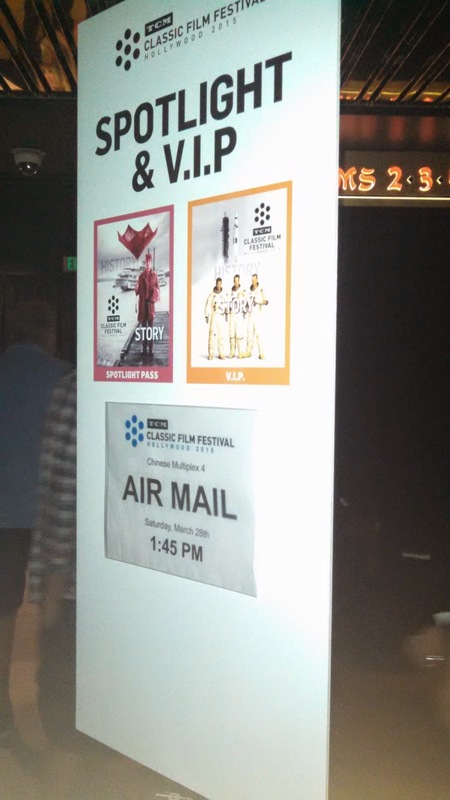 With only a bag full of snacks to sustain me, I got right back into line again to see Air Mail (1932), an early John Ford drama. Leonard Maltin introduced the film, and he warned us that we weren't about to view a classic. Nevertheless, he said that it was an enjoyable watch. With that framework, it was easier for me to enjoy the drama on its own terms. It's the story of the pilots on an air mail outpost. In a rare hero role, Ralph Bellamy is sympathetic, but has a slightly stern effect. I could see why he never made it as a leading man. When he softens, he's more likable, but that wasn't the proper persona for a dramatic lead. Pat O'Brien steals the film in a flashy part as a skilled, daring, but irresponsible pilot who has an affair with a pilot's wife and angers the rest of the men with his reckless flying. It was amusing to see him playing a cad. A shame he didn't do that more often. Also in the cast: Gloria Stuart in a slight, sweet performance and the always intriguing Leslie Fention in a small role. It was an entertaining film,with some great stunt flying. As one of the few new-to-me picks at the festival, I was happy I took a chance on it. Though I probably should have taken the time to sit down for a decent meal, I wanted to make sure to get in line early to see Shirley MacLaine before The Apartment (1960). If I'd only known those two hot dogs and BBQ chips were going to end up being my dinner, I might have gone for something better. I've written a bit about Maltin's conversation with Maclaine here. It was definitely one of the highlights of the festival, mostly because the actress doesn't hold back. She freely gives her opinion on everything, so you know who she didn't like and that gangsters were teaching her to cheat at cards. The woman has led a colorful life and she is unapologetic about the unconventional nature of it all. While I enjoyed the film, I had my usual problem of losing patience with it. There are memorable moments scattered throughout and everything, from the performances and script to the music and cinematography are top notch. Still, it always starts to drive me crazy around the mid point, I think because so many of the characters are just horrid people! I'd originally planned to check out The French Connection (1970) next. I've always wanted to see that movie on the big screen, but I couldn't resist the novelty of the Return of the Dream Machine: Hand-Cranked Projector Show. This program of one hundred year and older films, presented with a hand-cranked projector as they were upon original release, was unlike anything I'd ever seen. Randy Haberkamp of the Academy of Motion Picture Arts and Sciences presented the program, which included an introduction to each film. He gave a short history of how projectors like the 1909 Model 6 camegraph motion picture machine to be used that night were used in the early days of cinema. He explained that projectionist Joe Rinaudo would be steadily cranking the handle of the projector at the same rate of speed as the camera operators who filmed the movies. The program included some of the most famous early films, including A Trip to the Moon (1902), A Corner in Wheat (1909), The Great Train Robbery (1903) and one of my favorite silent shorts, Lois Webers' aptly-named Suspense (1913). There was something very reassuring about seeing the projectionist's arm moving in the shadows next to the screen. It was an unusually intimate way to see movies. The whole thing felt like a special presentation at a museum, rather than a typical screening. It was an eye-opening experience, because it made me think about how much the way we see films has changed and what kind of an effect that has on viewer perspective. I dashed out after the last film on the program to get in line for the next film, and missed a surprise entry, a hand-colored serpentine dance from over one-hundred years ago. I hear it was gorgeous. Next year I am definitely going to make a point of enjoying the film I'm watching to the end, instead of fretting about getting into the next line. By then I was ready to collapse, but I couldn't bear to miss the rare opportunity to see Nothing Lasts Forever (1984). I knew I would probably fall asleep, but I was determined to see what I could of Tom Schiller's underseen nostalgic film, which hadn't even been broadcast on television until TCM aired it earlier this year. I happened to miss that TCM showing, and when I finally settled down to watch it on Watch TCM, the last day it was available, I fell asleep because I'd had an unusually busy day. The film's star Zach Galligan introduced the film, and he shared lots of entertaining stories about his early career, in addition to a good back history of the film. He was auditioning for Risky Business at the same time as Nothing Lasts Forever, and he thought that Tom Cruise's breakout hit was sure to be a flop. There are many reasons that the film Galligan decided he wanted became the one to fade away. It was completed when there were several new executives at MGM who didn't understand how to market the film and didn't want to figure it out. There were also rights issues with some of the stock footage used. The final death knell was a failed screening in Seattle (which surprised me, I thought we were a pretty progressive film town by then). Then Galligan announced that Tom Schiller was in the audience. The surprise appearance delighted the crowd. Though the director was shy and seemed quite happy for his lead actor to handle the introduction, he also looked pleased that his work was being recognized. I talk more about their appearance in my stars post. The movie was perfect for the midnight slot: quirky, mysterious, funny and deeply cynical about the 1940s-style, but also strangely futuristic society it depicted. I have to admit I never fully understood what was going on. I was running on fumes by then, and falling in and out of sleep for most of the film. But I was alert enough to enjoy the movie's unique beauty. I liked the way it moved between color and black and white, creating the dramatically opposing worlds of Earth and the planet our hero travels to by bus. It also gave actors like Dan Aykroyd, Bill Murray, Imogene Coca, the astonishly-named Apollonia van Ravenstein and others the opportunity to play out their own personas while also embodying these unusual characters. Apparently TCM will be showing the film again in May, so I'll be sure to watch it when I've had some decent sleep. From what I did see, it's a treasure. I don't remember how I got back to the hotel. I was a zombie, but so ready for day four! I've been enjoying these posts on the Fest! The projector show sounds fascinating. Why Be Good sounds fun. I'm looking forward to enjoying it at a nearby screening in a few weeks. Been curious about Nothing Lasts Forever but after reading your review I'm a bit more cautious about setting my hopes too high. I'm so glad you've been enjoying the posts Tom. I wanted to give the feeling of being there as much as possible. I've got the feeling that Nothing Lasts Forever is something special, and I really want to give it another try. Watching movies while you are exhausted can give you a strange perspective. Great that you can check out Why Be Good on the big screen. That was so much fun with an audience! I hope you write about it.